The Technoscience Research Unit has been working in Collaboration with the Politics of Evidence Working Group at York University, lead by Natasha Meyers. The Politics of Evidence Working Group is a coalition of academics, scientists, and activists formed in 2014. Together we aspire to challenge the fraught politics of evidence in Canada today, troubling the obstacles that interfere with our right to know about the health and well being of our bodies, communities, and environments. Carla Hustak and Michelle Murphy both serve on the Steering Committee of the Working Group. The TRU also has a representative on the organizing committe of the non-profit Our Right to Know, which is coordinating a national network of organizations concerned with the current politics of Canadian science and research. As part of this collaboration, Carla Hustak has published two interviews with former and current federal scientists working on environmental questions, including endocrine disrupting chemicals. 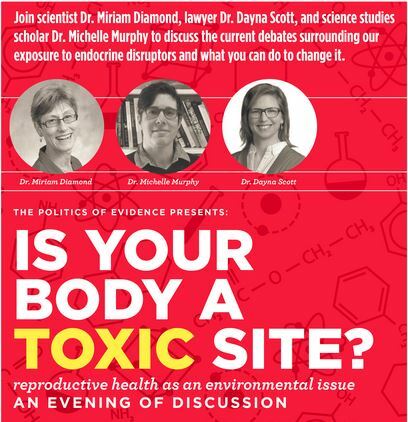 As part of this collaboration, and in partnership with Environmental Defense, Carla Hustak organized a public forum and discussion “Is Your Body a Toxic Site? Reproductive Health as an Environmental Issue.” The event explored what we know about the endocrine disrupting chemicals in our waters, air, and consumer products, and our relationship to science, government, industry and environmentalism. What does the research tell us? How are they regulated here in Canada? Why don’t we know more? The TRU members are continuing to work with the Politics of Evidence Working Group to develop position papers on the state of the Canadian Environmental Protection Act as it relates to endocrine disrupting chemicals.